Twisting Machine Mod. TWISTER for fancy yarns in 2 heads element. - It winds directly the twisted yarn on cone after having waxed it with a micro motor waxing device. - From 9 up to 200 twists per meter. - The speed of the hollow spindles motors and the winding speed are adjustable. - Cones to be used on the hollow spindles: 6" traverse, 5°57' only. - Take up cones: 6" traverse, 5°57' (others upon request). 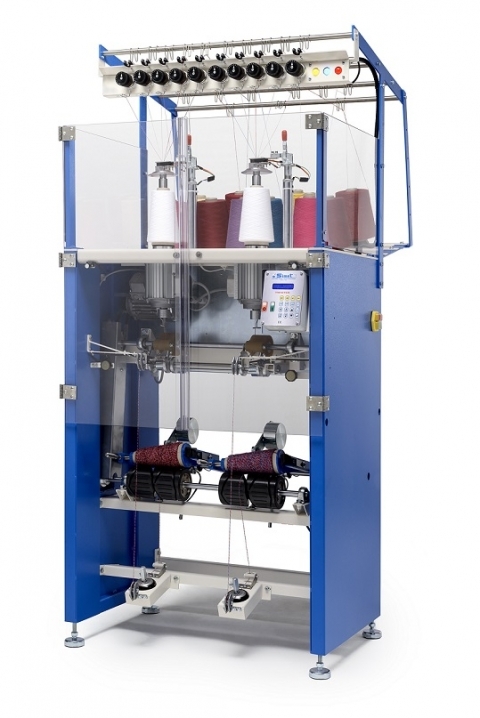 - Supplied with 3 electronic sensors for the creel feeding yarns, and with electronic sensors on the yarns from the hollow spindle, that permit the twisting up to 4 plies each head. - Automatic stop in case of breakage or lack of one of the plies; when the cone reaches the preset diameter and if too unbalanced cones have been put on the hollow spindles. Can work as twisting machine, as assembly winder and as cone-to-cone winder. - To set 4 "working memories". In conformity with the EC standards and complete with instructions and maintenance handbook.